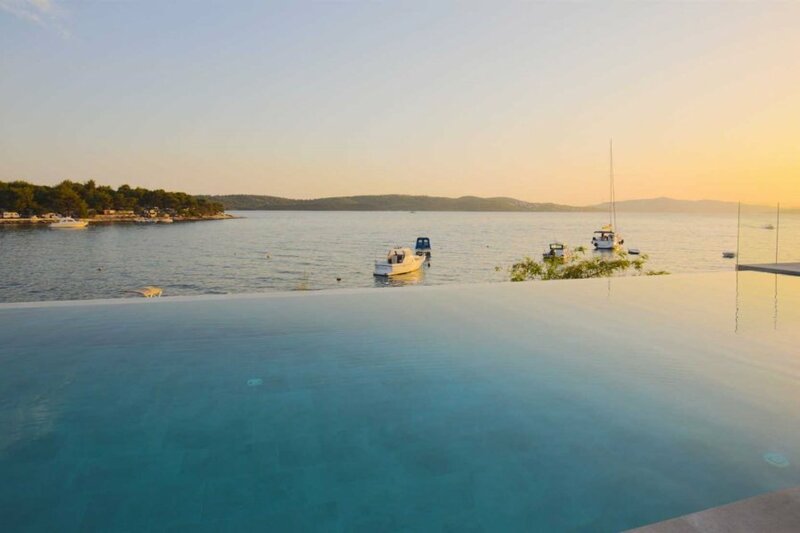 This 5 bedroom villa with shared pool is located in Trogir and sleeps 10 people. It has WiFi, a garden and barbeque facilities. The Beachfront Villa Deep Blue with Pool I is located on the island of Ciovo which is connected to the mainland by a bridge. It is connected with the astonishing city Trogir which has a rich cultural heritage and will charm you with its numerous alleys and squares. The Beachfront Villa Deep Blue I has a modern living area with an exit to the terrace. The kitchen is fully equipped. The shared outdoor pool has a surface od 100 m2 and is ideal for relaxing. On disposal, you have a barbecue. The beach is right in front of the villa and is private. On disposal, you also have free parking and Wi-Fi. If needed, we can arrange a baby chair and baby cot free of charge. The beachfront Villa Deep Blue I has a wonderful sea view and is equipped with high-quality furniture.